Rear shock: High-quality aluminium body with adjustable preload. Easily accessible combined damping adjuster (affecting 80% Rebound and 20% Compression), positioned on lower fork of shock. Choice of four spring rates, 110Nm, 120Nm (standard) 130Nm & 140Nm. Above 120kgs total rider & luggage weight select 140Nm spring, this is the maximum weight spring offered. 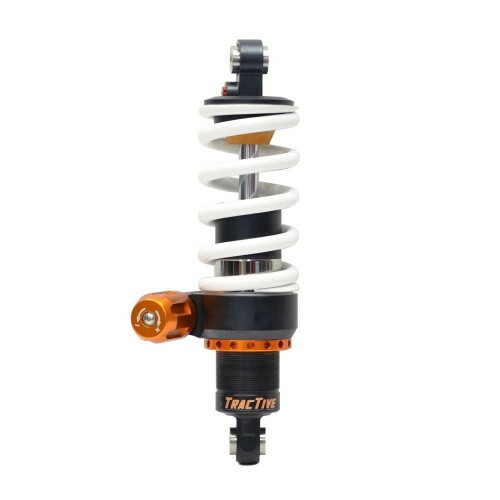 NOTE: FITTING THIS SHOCK DOES NOT AFFECT THE OEM REAR WHEEL MOVEMENT OR ALTER THE SEAT HEIGHT. It will allow the preload to be adjusted by up to 10mm with the simple turning of a knob on the remote adjuster, which adjusts the preload on the spring by means of hydraulic pressure. Simple to fit, and no maintenance required.